Jere Brown, the former CEO of Dimension Data known as a fierce competitor with a commitment to customers and a passion for philanthropy, passed away Tuesday evening. Brown died just one month shy of his 66th birthday, causing the IT channel to lose one of its most beloved executives. Brown spent over 30 years in the IT business, and in 2004 joined Dimension Data as a senior vice president of sales. He took over as CEO of Dimension Data in 2006, and in 2013 retired from the company. Prior to his entry into IT, Brown was a linebacker in the World Football League. He played for the New York Stars and the Charlotte Hornets in 1974 and 1975. He graduated from Villanova University in 1974 with a degree in political science. Brown was a true industry icon, and one of the most influential executives ever, said Chris Wolff, global head of OEM and IoT partnerships at Dell EMC who worked with him at Dimension Data until he retired. Brown had a way of spotting talent and bringing out the best in people, Wolff told CRN. Because of Dimension Data's close relationship with Cisco, he had heard of something called "solutions marketing." "He asked me to look into this," she said. "I did, and it made a big change in my life." That way of empowering his staff had a big impact throughout the entire company, Wolff said. "Jere was able to create new go-to-market concepts around technology management, our culture, and business development programs, and gave us a lot of clout to develop them," she said. "This rippled back to the industry, and gave us the ability to respond quickly to customers and provide feedback. And it let Dimension Data retain its sales staff better than any company." Brown was also known for his HPC, or High Performance Culture, program which stated the expectations of each employee at Dimension Data, Wolff said. First and foremost was his order to put the customer at the center of everything employees did. "He said that for our customers to stay in business, they need innovation, and that we had the responsibility to bring those innovations to them," she said. "He was focused on customer needs, not on what we sold." Brown was also a big friend of the National Multiple Sclerosis Society, and while he was CEO at Dimension Data sponsored a team of bike riders that became known as the "Hooligans," Wolff said. There’s a feeling of free when riding bike especially with the wind at your back. "He invested big in the Bike MS: City to Shore Ride," she said. "He outfitted all the Dimension Data riders, and rode at the head of the pack. Cycling was a passion of his. I heard he did a 50-mile ride just a week before he passed away." As a former football player, Brown loved the idea of the game ball, Wolff said. "Every year, he gave a game ball to one employee during Dimension Data's annual conference," she said. "I got one for solutions marketing." Brown was also famous for his red vest he wore every Christmas, Wolff said. "Some people called it awesome, and some called it hokey," she said. "He was also known for Jere Brown TV, a monthly Internet broadcast to all the Dimension Data employees when he would tell us how we were doing. And he wore that red vest during his Christmas broadcast." It is unbelievable to think that Brown passed away, said Frank Rauch, vice president of Americas partner organization at VMware and a 30-plus year friend of Brown's. Brown lived about two miles away from Rauch, and he and his wife regularly biked to Rauch's house when they were in the neighborhood, Rauch told CRN. They last saw each other just a couple weeks ago. Rauch considered Brown not just a close friend but also a mentor. "He was a good mentor to me and provided great advice," he said. "When I moved from Hewlett-Packard to VMware, I relied on him a lot for help." Brown was known for his ability to remain calm under difficult circumstances, Rauch said. "I didn't know him as an athlete," he said. "But a lot of people say an athlete can slow down the game, right? He could. When things were moving too quickly, he could slow things down and come up with the right advice. … Everybody who worked for him absolutely loved him." Wendy Bahr, senior vice president of the global partner organization at Cisco, told CRN that Brown's death was "truly devastating." "He was an incredible guy," Bahr said. "He will be missed." Brown had a close relationship with Bahr because of his strong advocacy of Cisco, and worked with Bahr via his position on the board of directors at Auburn, Wash.-based solution provider Zones, she said. "Jere was also a close friend," she said. "People who worked with Jere loved him. And he was always a fierce competitor, whether he was playing golf with his lovely wife Kim who is also a great golfer, or with his Hooligans. He will be missed." Denise Messineo, who managed the human relationships part of Dimension for over a decade and retired as senior vice president of HR shortly after Brown left the company, told CRN that he was the best leader she worked with in her 35 years in the business. "I was with Brown during two downturns in the IT business," Messineo said. "During both, his first thought was, 'What will be the impact of any business decision on the employees? He tried hard to avoid a layoff. One of his favorite lines was, 'You can't cut your way to profitability.'" Messineo said the Dimension Data riding team for the Bike MS: City to Shore Ride became known as the Hooligans because of the energy they put into the event. The riders rode peloton-style in which each member followed right behind another to cut down on wind drag, she said. "They were riding so fast, averaging 20 to 22 miles per hour," she said. "Some other riders complained they rode too fast, and called them hooligans. The name stuck. To be a Hooligan, you really had to prove yourself. The riders really stepped up their riding. They rode a certain pace, and weren't going to wait for anyone." Brown, after he took over as CEO, personally set up the company's Canadian and Mexican offices, and hired the first people in those offices, Messineo said. "He used a napkin to write the employee agreement in Canada, and then came back to me and apologized," she said. "They framed that napkin in their office." 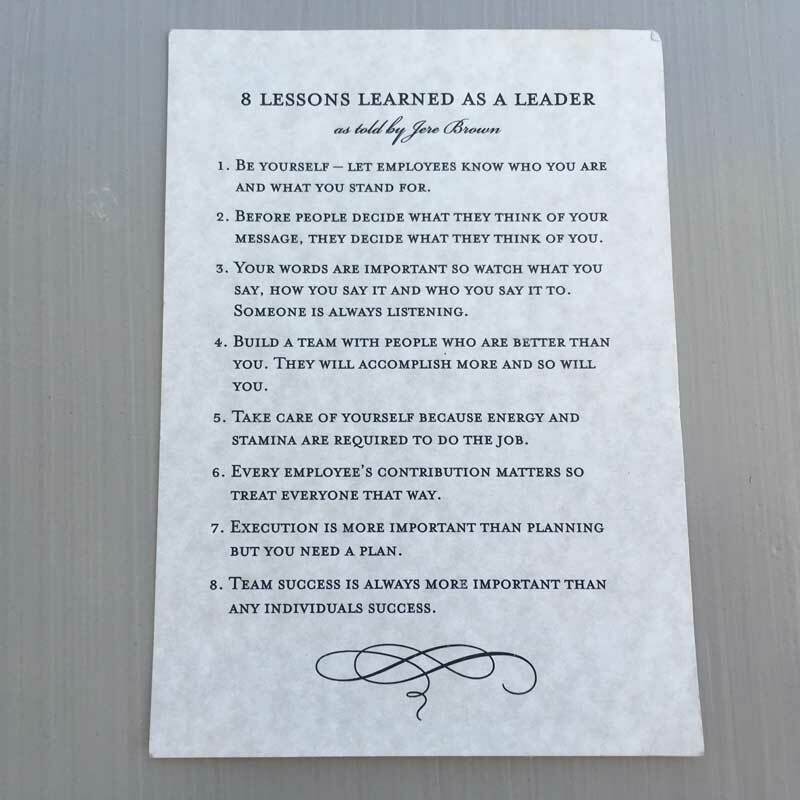 Wendy Lucas, who served as country manager for Dimension Data Canada and was the first employee for that company, told CRN via email that Brown had a list of eight leadership qualities that summed up how he treated employees and customers (see the photo). He shared those lessons on a note to his team at his retirement party. "This sums up Jere’s Leadership principle’s and the way he treated everyone," Lucas wrote. "A great mentor, friend, one of the best people we will all have ever known." Dimension Data executives were unable to talk with CRN about Brown's legacy. However, in an emailed statement, the company said, "We are saddened to learn of the passing of our friend and former Dimension Data Americas CEO, Jere Brown. Jere was a tremendous motivator and leader. We continue to feel his presence and legacy through the high-performance culture he helped establish and exemplify." Brown is survived by his wife Kim and two sons, Matt and Tyler, along with his sons' families.